“Every Friday a group of 10 (Ten) students ranging from class V to X will be invited for a dinner along with the Deputy Commission at his Official Bungalow. Further, these selected students will also be given a chance to observe the working of District Administration during office hour (Post Lunch). Students shall be selected school-wise on rotation basis. They shall be given an opportunity to express their Dreams/Visions and shall also be asked to express their desire as how they wish to see the District in the future days to come. Separate letter shall be written to School Authority concerned to select the students”. 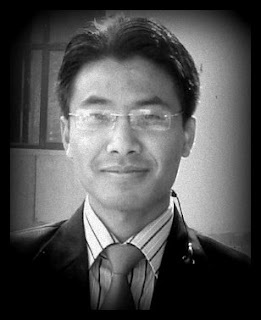 A product of Delhi University’s St. Stephens college where he did B.Sc in physics, Pame has earlier served as assistant commissioner in Ukhrul district and sub-divisional officer in Senapati district — both inhabited by Nagas. Pame is the first IAS officer belonging to Zeme tribe of the Nagas. Pame came into limelight five years ago when he initiated building a 100-km road linking Manipur with Nagaland and Assam, all with the funds raised from citizens. His family — his elder brother is a faculty member of Delhi University — donated about Rs 4 lakh for the purpose, according to media reports published then. Also, donation centres were set up in major cities such as Delhi, Bengaluru, Chennai, Pune, Guwahati, Shillong etc. Even NRIs from USA, UK and Canada contributed for the Tamenglong-Haflong road project, often called People's Road. After the IAS officer could raise Rs 40 lakh for the project in 2012 through his Facebook page, he was invited to Facebook headquarters in California, USA. He too received a number of awards for his innovative project.